The Obadiah Bible icon. Click the Bible icon to see all the others. The book of Obadiah is a brief prophetic word regarding the nearby nation of Edom. And it’s not good news for Edom. Israel has a longstanding rivalry with the nation of Edom, but now Edom has gone too far. When the Babylonians attacked Jerusalem and the temple of God, Edom was there—cheering on the Babylonians (Ps 137:7; Ob 10–11). Obadiah’s message is simple: no matter how safe they think they are, no matter how wise they think they are, Edom can’t get away with this (Ob 4, 8). So God sends his messenger to them: a man named Obadiah (Hebrew for “servant of Yahweh”). Through Obadiah, God swears to turn the tables on Edom. Edom may seem to have won, but the Lord prevails in the end. Obadiah unpacks a longstanding history between Israel and one of its enemies—and more importantly, the history of God’s covenant with Israel’s ancestors. The Israel vs. Edom rivalry is more than just two nations who don’t get along. The struggle begins in the book of Genesis. God made a promise to Abraham: He would bless those who bless him and curse those who curse him (Gn 12:1–3). That blessing was passed on to Isaac, Abraham’s son (Gn 21:12; 26:24). Isaac’s wife Rebekah had twins: Esau and Jacob (Gn 25:24–26). God told Rebekah that one nation would prevail, and that Esau would serve Jacob (Gn 25:23). Isaac (accidentally) reiterated this promise, making Jacob the master of Esau (Gn 27:29). How did that happen? Esau sold Jacob his birthright for a bowl of soup, and then Jacob tricked their father into giving him the blessing of the firstborn. Esau wasn’t too happy about that, and for a while, he was bent on killing his twin. Jacob and Esau eventually resolved their differences (Gn 33:4), and God gave both of their descendants a land. Esau’s descendants became the nation of Edom, while Jacob fathered the 12 tribes of Israel. Israel’s capital was Mount Zion (Jerusalem); Edom’s was Mount Seir (Dt 2:5). Both had an inheritance. Both had a mountain. Only one was God’s chosen people. As time wore on, the relationship between their descendants became strained. Edom refused to let Moses and the Israelites take the highway through their land, and opposed them militantly (Num 20:20–21). When Israel was serving God under the righteous king David, God’s prediction to Rebekah came true: Edom served Israel as a vassal state (2 Sa 8:14). But after Solomon and Israel turned from God, the kingdom divided and troubles with Edom reignited (1 Ki 11:14, 2 Ki 8:22). When God finally exiled Judah to Babylon, Edom helped the Babylonians loot Judah,and happily returned to their own fortified cities in Mount Seir (Ps 137:7; Ob 10–11). The Jews knew the story of Jacob and Esau, though. They knew about God’s message to Rebekah. So why would He allow the Edomites to do this? The book of Obadiah shows that God will not forsake His promises to Abraham, Issac, and Jacob. To the Edomites, it’s a message of judgment and doom. To the Jews, it’s a message of faithfulness and salvation. Obadiah is the fourth of the Minor Prophets, the last 12 books of the Bible. When God had a message for the people, He gave his message through the prophets. These messages came in visions, oracles, dreams, parables, and the like. Most of the Minor Prophets are messages to the people of Judah and Israel (the Southern and Northern Kingdoms of God’s people), but Obadiah’s vision is different. Like Jonah and Nahum, Obadiah’s writings mainly concern the people outside of Israel—in Obadiah’s case, it’s the nation of Edom. A portrait of Obadiah. Click his portrait to learn more about authors of the Bible. 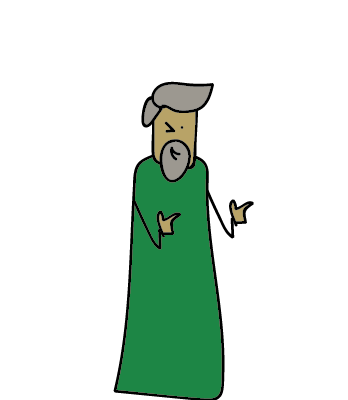 We don’t know much about the prophet Obadiah or when his book was written. Most scholars date this vision around the time of Jeremiah, when God had delivered similar messages concerning Edom (Je 49:7–22). Some Jewish traditions claim that this book was written by the Obadiah who served King Ahab, which would make him a contemporary of Elijah (1 Ki 18). Obadiah is the shortest book of the Old Testament, and the fourth-shortest book of the Bible (after Third John, Second John, and Philemon). 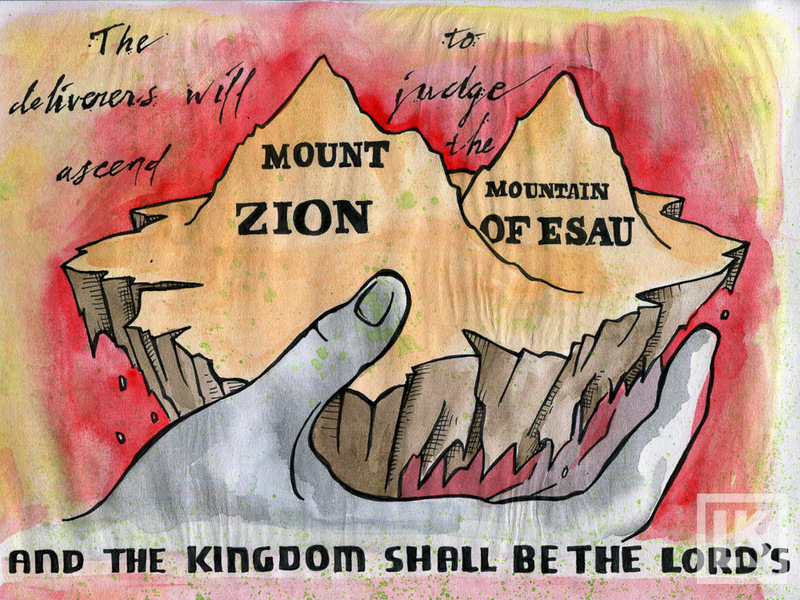 The book of Obadiah begins with a promise to bring Edom down from their mountain (Sier), and ends with the deliverers of Israel ascending Mount Zion to judge Edom. 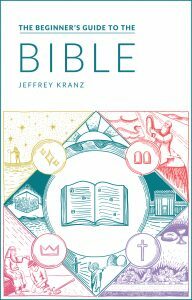 Bible art by Laura Kranz.